Ta-da! Above is the money shot because A) it wasn't taken by me and B) it shows 90% of the room's goods. 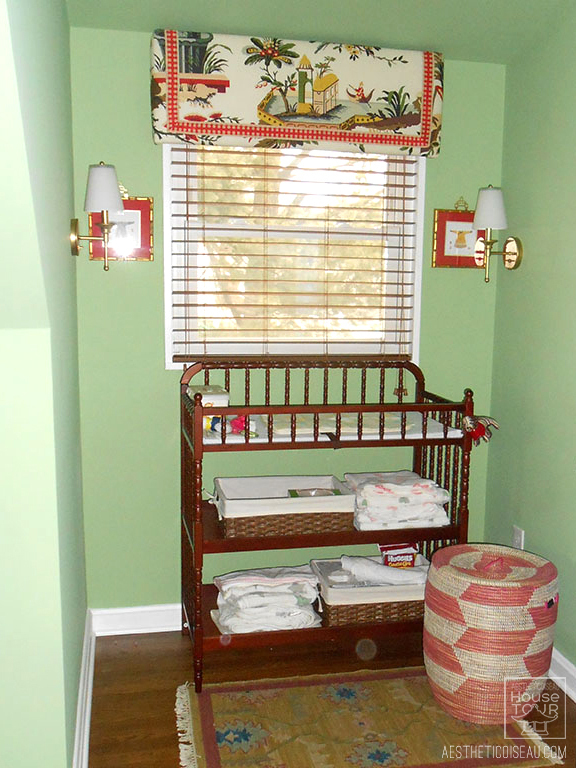 We opted for a crib and twin bed combo and love how it turned out. 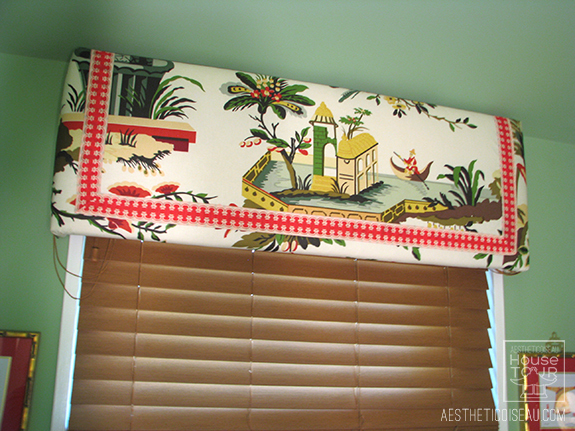 I made a huge valance box to really highlight the Le Lac fabric and trimmed it out in the most adorable red ribbon. 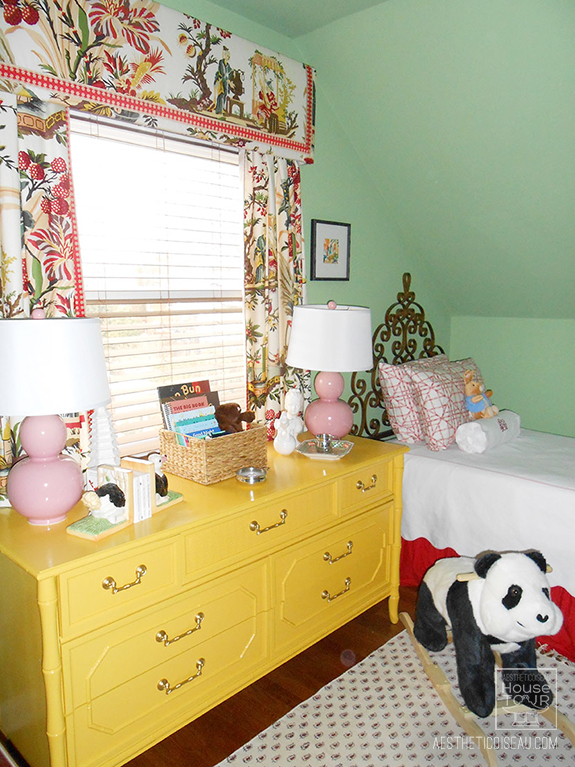 See how the painted dresser turned out? A yellow paint job with gold hardware was the way to go! 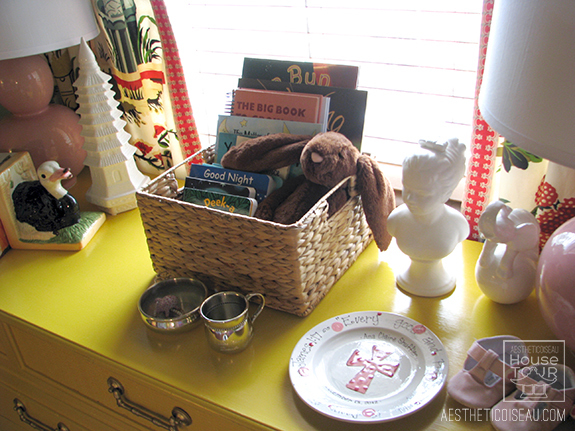 You can also see a glimpse of the vintage headboard I bought and our Jenny Lind crib. Sorry for the terrible photography, y'all. I just don't have that talent and I even borrowed a fancy camera! I probably should have shelled out some cash for professional photos but let's all use our imagination. 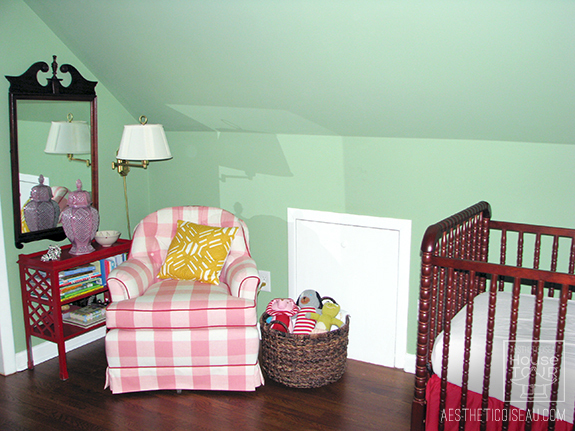 This room is so dark - great for sleeping babies, bad for blog photography. Above might be the only shot of the light fixture - an awesome vintage pagoda-style situation that was originally yellow and got a coat of glossy red spraypaint. Don't ask me why, but I always wanted a Jenny Lind crib in cherry. I'm glad I had already made that decision pre-baby because it was a great piece with which to start building the room. Once I actually went to purchase it, I was thrilled that it was one of few inexpensive choices on the baby crib market. After a weekend meltdown realizing that huge and pregnant, I wasn't going to be able to sew a crib and bed skirt in matching red fabric, I turned to the internets and found the perfect ruffled red crib skirt for $20. Hallelujah. But, I found that it wasn't quite long enough. Luckily I had bought several (thinking I might cobble them together for the twin bed) and just sewed two skirts together (one on top of the other) to get more length for the crib. 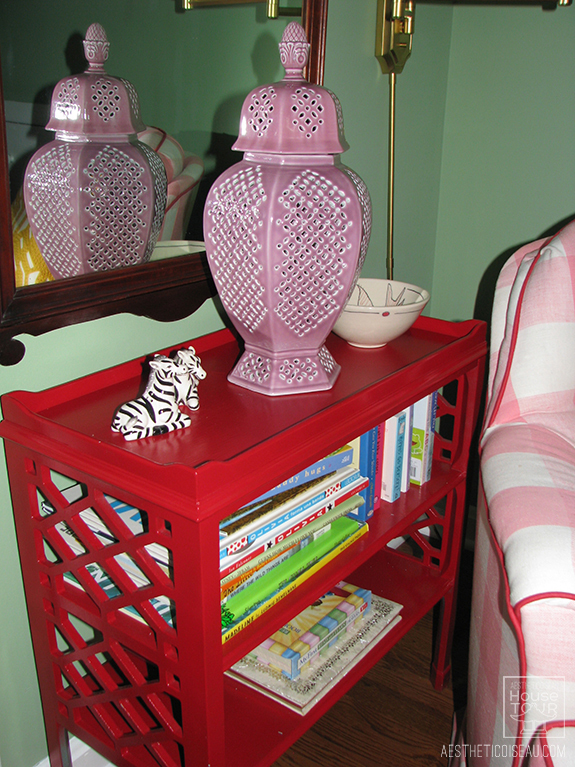 Looove the dresser. Took SO MANY coats of yellow paint, but so very worth it. I got Matouk's Le Scallop coverlet with pink piping for the twin bed as well as a matching bolster pillow with AC's monogram. 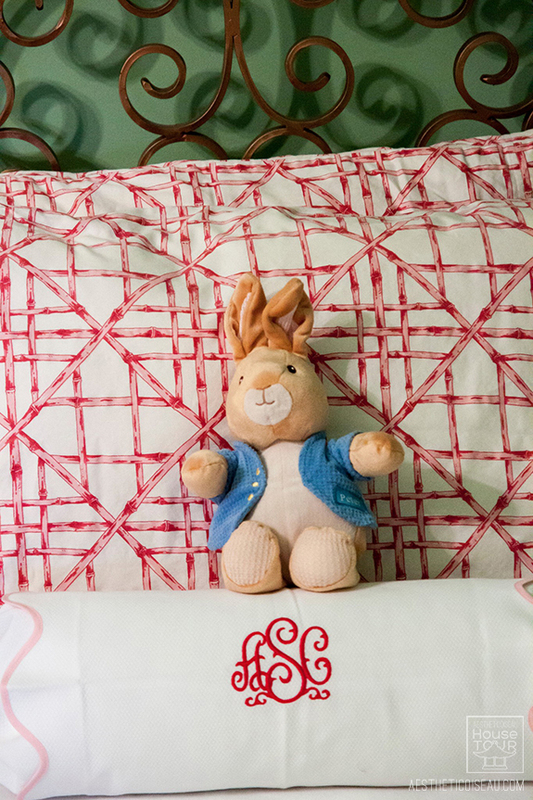 The scallop detail on the coverlet is so sweet. 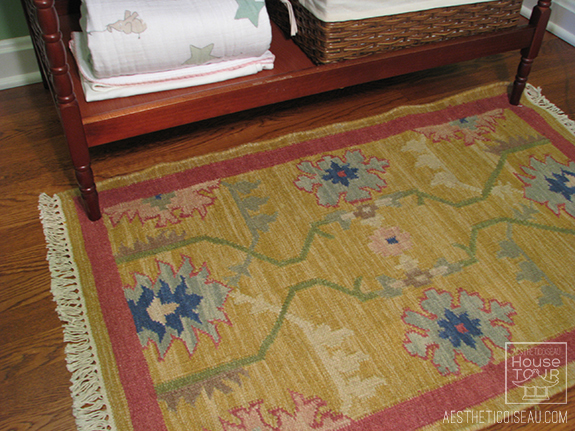 The shams are from Carleton Varney's line for HSN...had them for years and they finally found a home. The bed needs more zhushing - like a duvet and another pillow, but I ran out of creative juice and haven't seen anything I like yet. You can see this better in the first photo, but we opted for wood-toned blinds and they were a great decision. Really added some nice depth to the room as opposed to the crispness of white wood blinds. 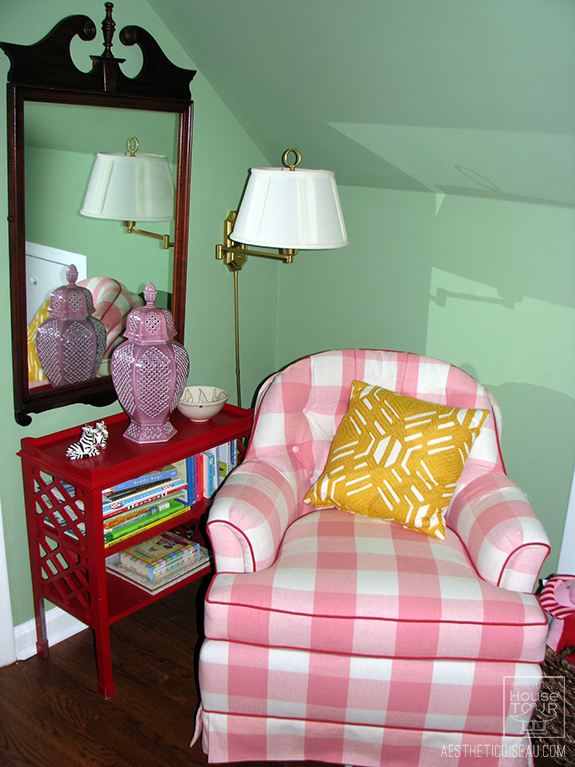 Obvi the valance box and curtains I made are the focal point of the room. I just could not be happier with this fabric choice and how it all turned out. 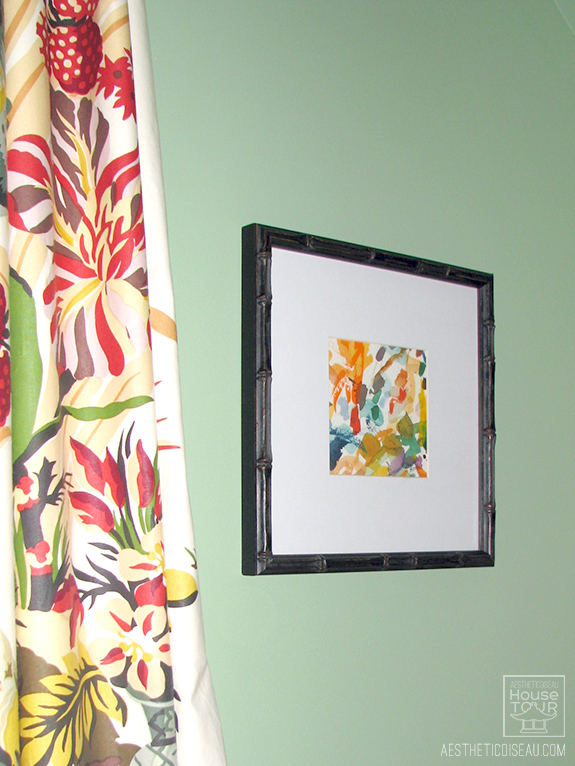 I framed two small watercolors by artist Jennifer Love to flank the window. Zebra salt and pepper shakers from Furbish. Clearly made for a nursery. This is the room's alcove, on the same side of the room as the twin bed. 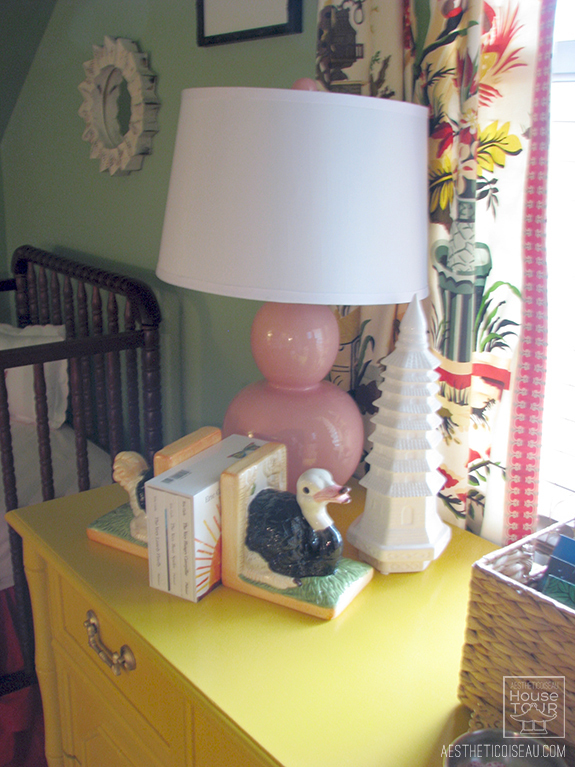 Made the perfect little area for our changing table in a Jenny Lind style that matches the crib. Those kimono prints are straight from Hong Kong! My friend Kat sent them and I about hyperventilated when I opened her sweet package that arrived from halfway around the world because they were PERFECT. I fretted forever about painting those sconce lampshades (which are glass) red, but then these little prints arrived and I didn't need to anymore. Thanks, Kat! 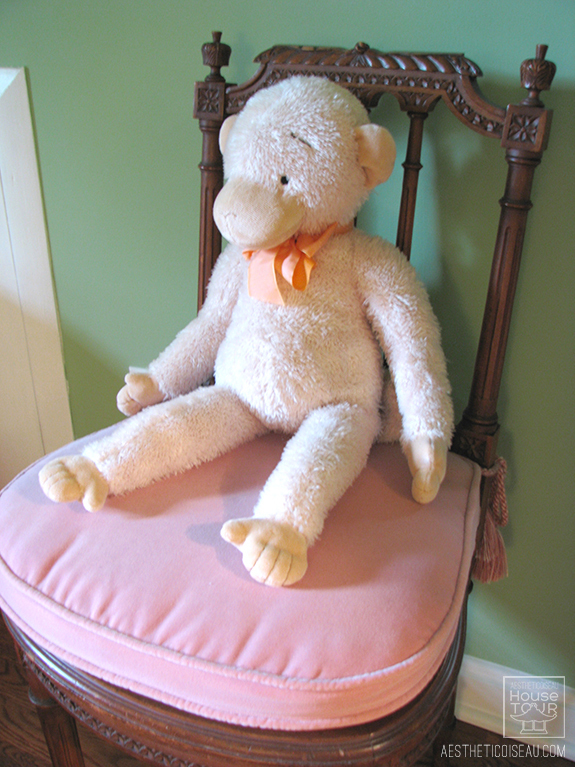 This little monkey sits atop a vintage chair that I bought not knowing where on earth I'd use it...but now it's found the perfect home at the foot of the twin bed. Great use of an impulse buy. I really wish I had better photography and styling skills, but hey, keepin' it real folks. Trust me when I tell you that this room is just delightful in person. At least I think it is. It's sweet and girly and I can really see it growing with Ana Claire. Lovely, just as I expected it would be!! Lucky little AC! What a great room! So interesting and I can see it progressing along with AC as she grows up. 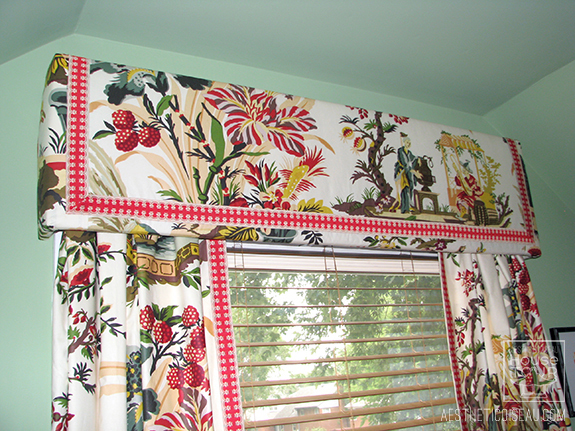 I love all the traditional and vintage pieces - the Le Lac window covering is just dee-lite-ful...great job on that! Adorable. You did a great job. It is absolutely fantastic. 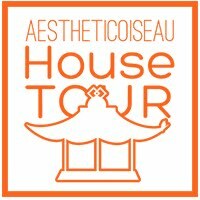 You did an amazing job and I see a new follower of Chinoiserie Chic in the making. It is so beautiful! I absolutely love it! 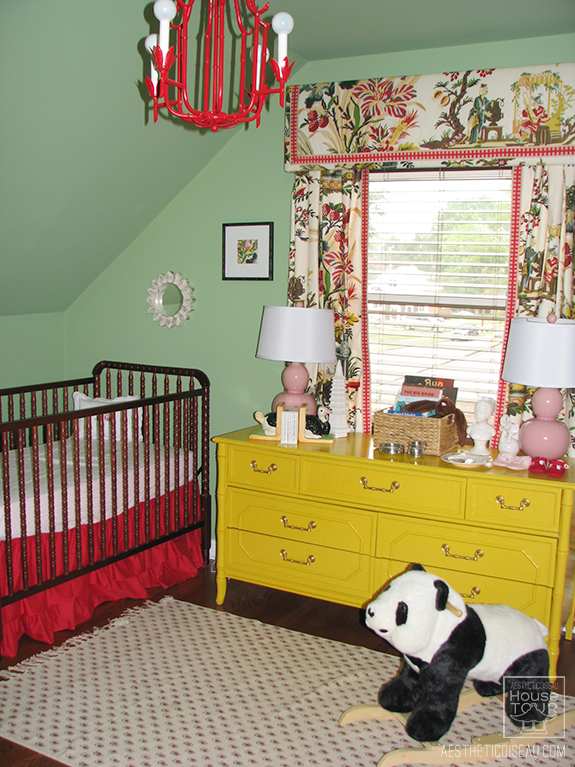 THe drapes and valance are fabulous and the crib and twin bedding are just so pretty. Great job! hello! 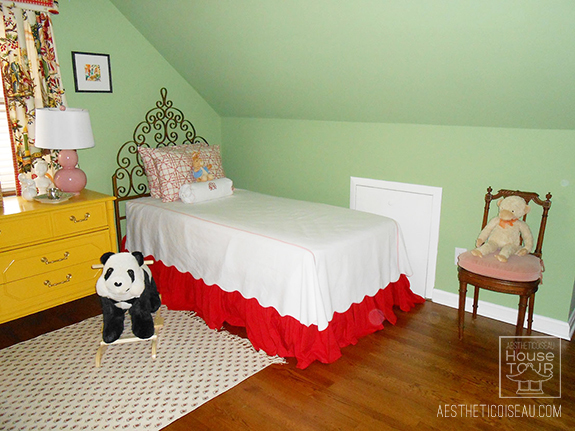 i've just stumbled upon your blog, courtesy of mr. goodwill hunting's, and i have to tell you- this is the most stunning nursery i've ever seen. EVER. it's just totally pleasing to the eye. what a lovely job!